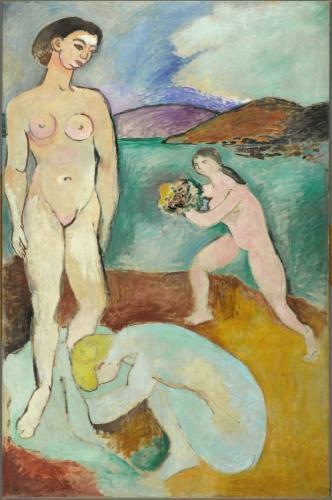 In Luxe I, Henri Matisse continues his researches on the theme of the Golden Age. Yet the subject is a puzzle: bathing women, a mythic scene of adoration, or an exercise in style, the same body rendered in three different poses? The Tuscan frescoes that Matisse had seen during his travels in Italy in the summer of 1907 are among many possible sources. This large-format painting, the end-product of several studies, has the air of a sketch with its rapid brushwork and sometimes skimpy colour. The painter Félix Vallotton spoke in 1907 of “the hypnotically quavering line adopted by M. Matisse”.